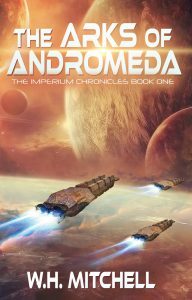 I now have both a Kindle ebook and ePub version of the completed Arks of Andromeda and I’m looking for people interested in writing a review. If you have a review site, please contact me if you’re interested. I will send you either the Kindle or ePub file to read. In his debut science fantasy novel, W. H. Mitchell introduces us to the stories that are intertwined in the fabric of the Imperium, from the richest nobles of the Five Families to the lowest dredges of the Underclass. Their adventures will take us to every crevice of Imperial society and beyond.